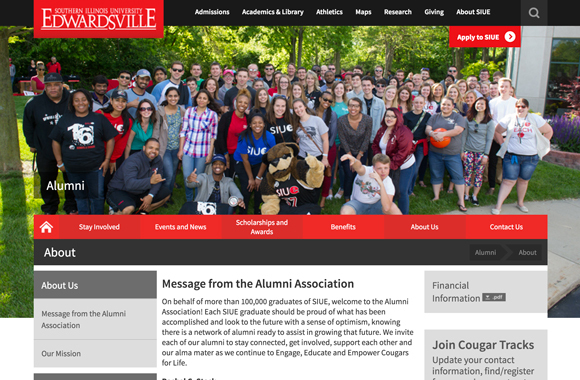 Have you visited the SIUE Alumni Association website lately? It is mobile friendly, and we are excited! The site also includes several online forms that allow you to contact us easily. Find out what’s happening on campus by visiting the new calendar page, which includes events sponsored by the University, Cougar Athletics, the Alumni Association and the SIUE Foundation. Register for Cougar Tracks Today! As the interest in creating alumni groups in other regions continues to grow, we will be able to create opportunities within Cougar Tracks for these alumni groups to communicate with each other, as well as other alumni outside the region. A Cougar Tracks ID is required to become a registered user of Cougar Tracks. Your ID appears on your alumni card and other Alumni and Foundation material. If you would like to receive your Cougar Tracks ID, please submit this alumni card request form. Check out this PDF for more information about Cougar Tracks. The SIUE homepage, about section and academics site also been moved into the new mobile-friendly design. SIUE has a huge web presence; we will continue to work on reformatting the rest of the site. We hope this new responsive design makes it easier for you to engage with us!